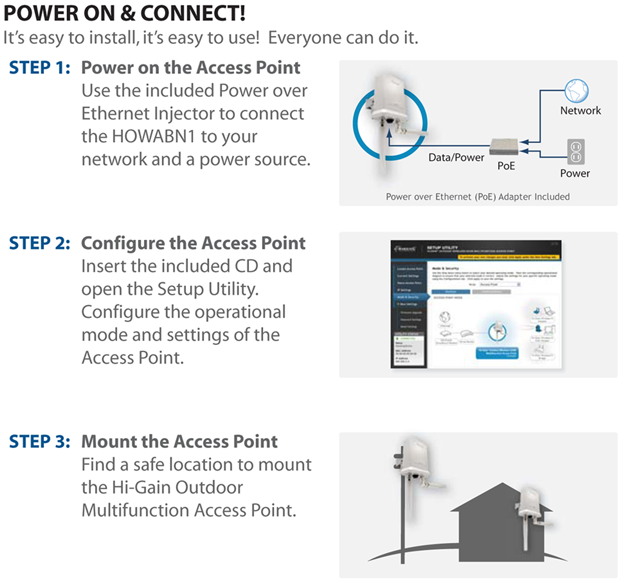 Satisfy all of your outdoor wireless needs with the Hawking Hi-Gain Outdoor Wireless-300N Multifunction Access Point. This versatile device combines an Outdoor Wireless Access point, an Outdoor Bridge, and a Outdoor Wireless Repeater into a single convenient device. And thanks to its completely weatherproof design, it can be installed in any outdoor environment. 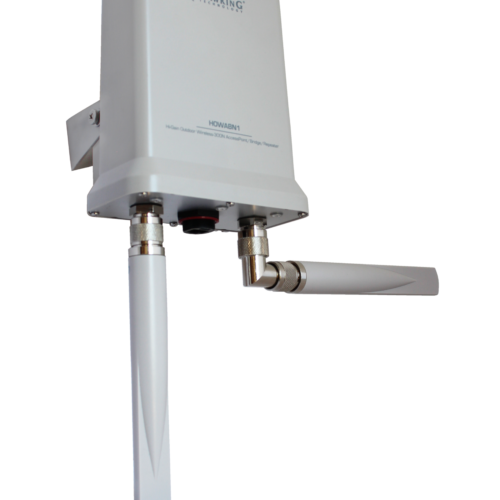 The HOWABN1 increases the wireless coverage of your wireless network up to 2X larger. It reduces your wireless deadspots, provides extended coverage for outlying devices. In addition, it stabilizes your wireless connection with high performance broadcasting technology. For the previously out of reach devices, you’ll see an improvement in the data transfer speed and a reduction in lag while streaming or downloading multimedia content (video, music, etc.) with the addition of the HOWABN1. The HOWABN1 is a 2.4GHz wireless 802.11b/g/n compatible solution that allows you to repeat signal from any wireless access point or wireless router. This product is designed with multiple operating modes: Range Extender (Repeater), Access Point, Bridge, Point-to-Point, Point-to-Multiple Point, and WDS Bridge. The Multifunction Outdoor Wireless Access Point provides optimal connectivity, regardless of what mode you’re using. 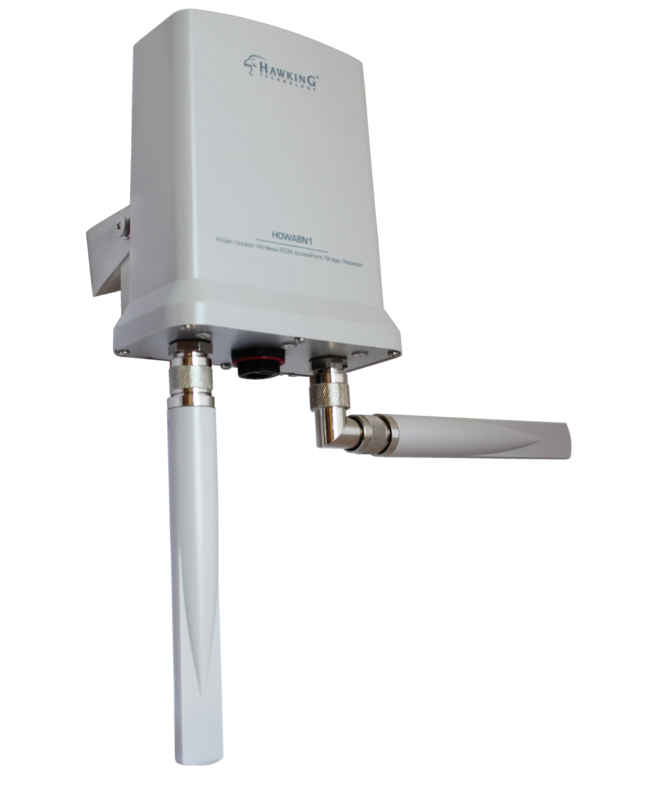 It features two high-gain antennas which allows the device to function over large ranges. So whether you’re using it as an access point or as a repeater, the Multifunction Outdoor Wireless Access Point will give you a robust signal. Use the HOWABN1 to connect to your boat. Use the HOWABN1 to create an outdoor hotspot. Use the HOWABN1 to bring your wireless network outdoors. The Multifunction Access Point has a durable design that can withstand the elements. Its outdoor enclosure is sturdy and watertight, and all of its components are waterproof. A waterproof gasket kit is included for coating the RJ-45 Ethernet jack, so you won’t have to worry about water damage to the repeater. The HOWABN1 also comes with a Power-over-Ethernet injector. This convenient accessory eliminates the need for a separate power cord; instead, power is transmitted to the repeater through your Ethernet cable. This helps reduce cable clutter and saves you the trouble of running a power cord outdoors. For added convenience, the cable can connect up to 300 feet and is extendable using an Ethernet switch. Use the chart below to see which Hawking Technologies Wireless Access Point / Bridge is right for you. The HOWABN1 Hi-Gain Outdoor Multifunction Access Point is a great wireless solution for consumers looking to take their network outside. 48V, 0.5A Switching Power Adapter (PoE). Provided PoE Injector is NOT weather proof and should be placed indoors or in a weather proof container. Access Point mode is used to convert a wired network to a wireless network. In simple words, if you have a Router which doesn't have the wireless capability, Access Point can be connected to it using an Ethernet cable and broadcast the wireless signal. You can also use an access point to connect to your wired network to create more wireless nodes. 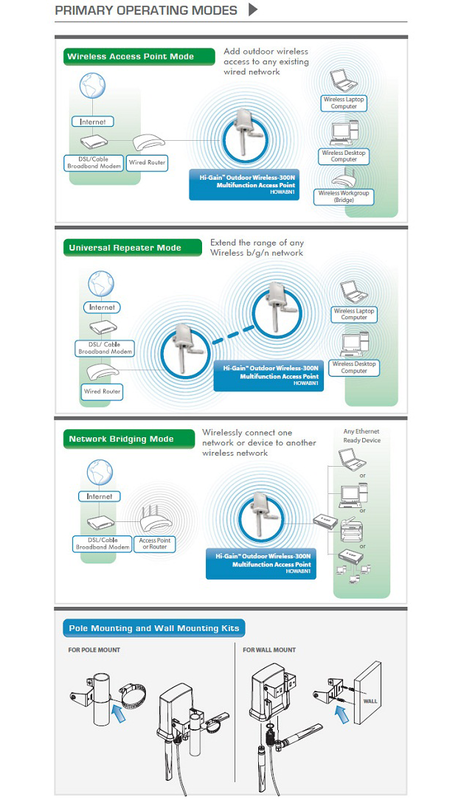 What is a wireless Universal Repeater? This mode allows you to repeat the signal of an existing wireless network without having to connect to the network. It will act as a stand alone wireless node. I installed the HOWABN1 easily, but now my signal intermittently drops every few days or weeks. First, be sure you upgraded to the latest firmware version. You can download the latest firmware from the support tab. Choose your version, then find the file and save it to your desktop. To upgrade, log into the extender and go to tools. Click on upgrade firmware and then choose the file you just downloaded. Click apply and follow the onscreen instructions. If you have already upgraded, and are still having signal drops, check the wireless channel on your router. Make sure it’s set to a static channel. Some routers use an AUTO function in which the channel changes itself periodically. If so, our range extender can’t update these changes and that may explain your disconnects. There are two antennas on the the HOWABN1 but I can't find an antenna adapter from your site. Can I replace these antennas? 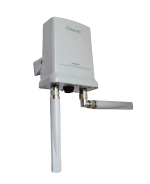 The HOWABN1's antennas are already optimized for the best wireless signal and throughput. Due to FCC regulations, we cannot recommend any 3rd party antenna adapters. How far of an Ethernet cable can I use to power up the HOWABN1? Wireless Distributing System. It is a form of repeater mode except it requires the same type of devices. If you have multiple HOWABN1’s, it’s a good way to create a huge wireless network to cover long distances. I plugged my HOWABN1 into a surge protector and when I scan, I can’t find the HOWABN1 on the network. What’s wrong? Try plugging it into a different socket or directly into the wall. Some UPS’ do not seem to provide enough power to turn on the HOWABN1. Also, make sure you plugged the HOWABN1 into the port labeled “Power + DATA OUT” on the Power over Ethernet (PoE) injector.